September was very kind to us this year. Aside from one miserably rainy cold weekend (which, as per tradition, happened to coincide with the beginning of the Toronto International Film Festival), it’s been non-stop sunshine and balmy temperatures. If it wasn’t for the fact that the sun’s been setting earlier and earlier each day, I probably could’ve convinced myself that summer was planning on staying around forever. October, on the other hand, is determined to set itself apart. Granted, it’s still a couple of days before we flip to the next page on the calendar, but the forecast is already shaping up to be cool, cloudy and most definitely fall-like. So I’m reluctantly packing away the last bits of summer and queueing up all of my fall favourites. Exit stage right the sandals and shorts, and enter stage left the brightly coloured tights, skinny cords and snuggly cardigans, and of course… rain boots. Sniff. Fall is also starting to sneak its way onto my menus in all its slow-simmered and stick-to-your-ribs glory, starting with this comforting Maple-Miso Pumpkin Soup. 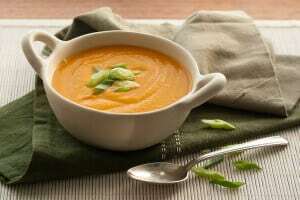 It borrows the flavours of a Maple-Miso Roasted Squash I posted a couple of years ago, but blends them up into a silky bright orange soup that’s designed to bring a spot of colour and warmth to those miserable rainy fall days. It starts with one of my favourite winter squashes, the kabocha pumpkin (or buttercup squash, as it’s sometimes called), which has a squat forest green exterior that splits open to reveal brilliant orange flesh with a sweet, mildly nutty flavour. 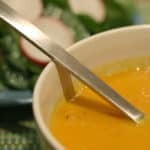 Kabocha is starchier than most squashes and can sometimes be a little on the mealy side, but that’s a very desirable characteristic indeed when it’s blended down into a soup, where that starchiness translates to a silky smooth puree that tastes creamy even when there’s not a speck of dairy to be found. And if it’s first been roasted with mild white miso, sweet maple and spicy Korean gochujang paste, then it becomes a thing of beauty indeed… It’s sweet and nutty and salty and spicy, and all it needs is a splash of fresh lime juice to balance it all out. Bring it on, October. I’m ready for you. This vegan-friendly winter squash soup is so thick and creamy you won't believe it's dairy-free. Preheat oven to 450F. Line a large baking sheet with aluminum foil. In a large mixing bowl, toss the squash cubes with 2 tbsp olive oil. Season with salt and pepper, and toss until the squash is well coated with oil. Tumble onto the prepared baking sheet and roast in preheated oven for about 30 minutes or until tender. Meanwhile, in a large heavy-bottomed pot set over medium-high heat, saute the onion in the remaining 1 tbsp olive oil until soft and translucent, about 5 minutes. Add the garlic and ginger, and continue sauteeing until soft, about 2-3 minutes. Stir in the chicken stock, miso, maple syrup, lime juice and gochujang, if using. Bring the mixture to a simmer, then add the roasted squash and simmer for 15 minutes to allow the flavours to blend together. Using an immersion blender, puree the soup until smooth. Serve immediately with a sprinkling of green onion. Gochujang, the savoury hot pepper paste that's ubiquitous in Korean cuisine, is what gives this soup its sweet-and-spicy kick. If you don't have access to a Korean market, try a large Asian supermarket like T&T or order online. You can still make this soup without it, but I really do suggest you get some. It is so hot in Sydney today (35C) and spring is just a month old! 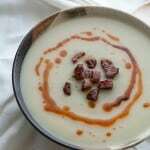 I much prefer cooler weather so I can eat soup! 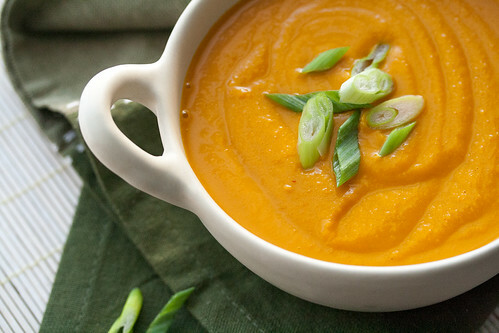 This looks great – have never tried adding miso to pumpkin soup. I was totally in denial about the coming of fall, but at this very moment I am sitting in a coffee shop cuddling a bowl of veggie soup, because my hands are FROZEN from being outside all morning. Fall is definitely in the air. I’ve never tried kabocha squash but I’m sure I’d love it. Your soup looks creamy and delicious. The perfect flavor and color for a wonderful fall meal! 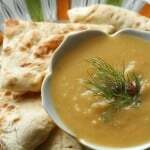 Here in Florida fall comes very, very slowly and I need delish recipes just like this to remind me of the season! Sounds yummy! It’s certainly soup season. This looks so comforting. Love fall flavors! 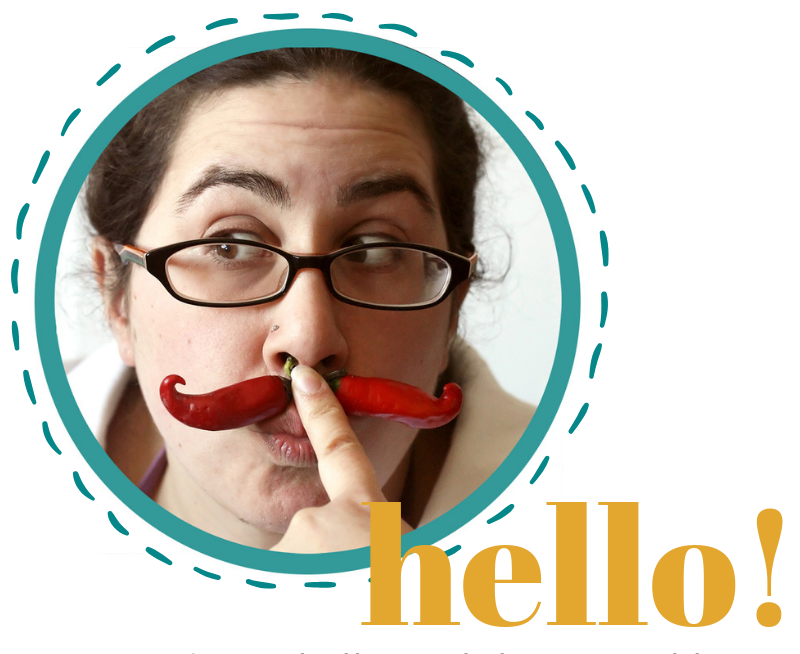 Fall is slowly sneaking its way down here as well and I’m all about making soups! 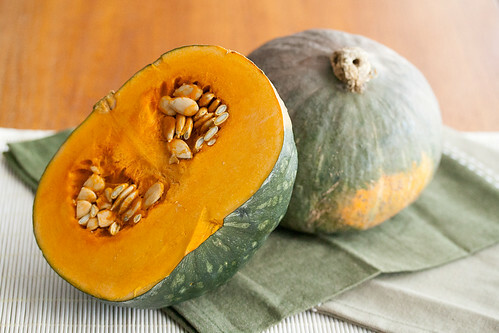 Love kabocha squash and how cool you also added miso and maple, great combo!! This soup looks so good! I love these type of purred soups with salads, such a great pairing! I have yet to try kabocha squash but it’s such a beautiful colour. I bet it makes an amazing. What a lovely combination of flavors! 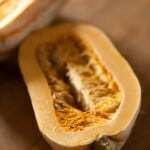 Miso, maple, and squash – all things I love! I LOVE kabocha squash! This soup looks fabulous! I really liked the summer extension and not looking forward to the cold this week. I think it will be a warmer weekend, though, thank goodness. Your soup sounds delicious. I love the miso-squash combination. What a delicious looking recipe! 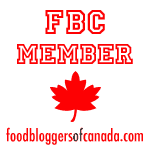 The first time I had kabocha squash was on my honeymoon – in Canada! We were in Vancouver and happened on a Japanese restaurant that served a whipped kabocha squash as an appetizer. Can’t wait to try this out!